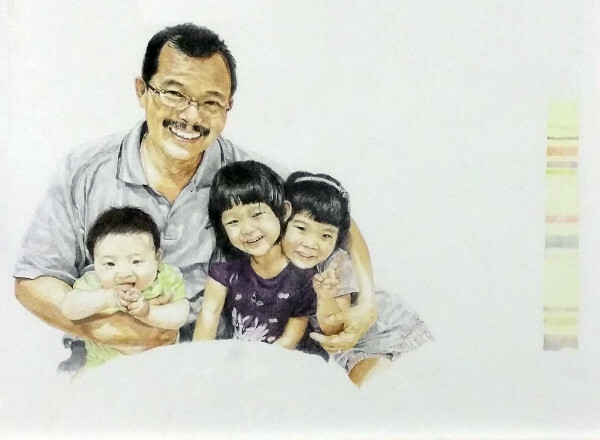 Joy commissioned Singaporean artist Leslie Low and created a one-of-a-kind art piece for her father's birthday. 1. What inspired you to create Legacy? My brother and I want to give our father something for his 59th birthday. When I saw some family portrait pieces, the idea of having all his grandchildren and him in one frame made perfect sense. 2. What was your father's reaction when he received the gift? He was very surprised and touched as he has never received an art piece before. 3. What did you enjoy most about the co-creation experience? The process of sharing the idea with the artist and seeing how it is realised through the artist's impression and skill. 4. Would you commission art again? Why or why not? Definitely. With increasing affluence and people already having all that they need and want, it gets harder to choose a gift for loved ones. Commissioning art is something practical as it can be used to decorate space and is extremely meaningful because it's thoughtful and one-of-a-kind. 5. What tip would you give someone who's new to commissioned art? Don't be afraid to chat with the artist and start the conversation going. You may be surprised where it might lead you. Thanks so much, Joy, for sharing your story with us! If you'd like to commission a portrait painting of your family for Christmas, chat with Leslie Low now!